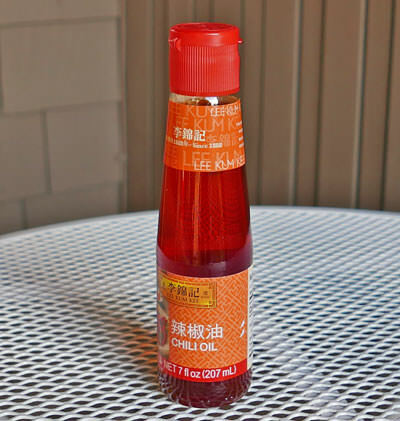 Made from oil pressed from fresh red Thai chiles, this is a nice, not-too-spicy oil with a special natural fragrance. Made by Lee Kum Kee. We also offer Peppercorn Chili Oil. A few drops adds a touch of chile heat, and beautiful natural bright red color. Many chefs like this just for the way it enhances the color of your food. The fragrance is so good. We like to add Thai chili oil to various recipes, especially the three mentioned below, also any noodle soups. Ingredients: soybean oil, dried red chili peppers. No preservatives. Product of China.